An Multiple Pointing Input System(MPIS) allows concurrent manipulation of multiple pointing devices. On a traditional Graphical User Interface(GUI), the users manipulate computer application by selecting or moving graphical objects on a screen with one pointing device. Usually, the GUI allows only one pointing device, so users can manipulate only one object. 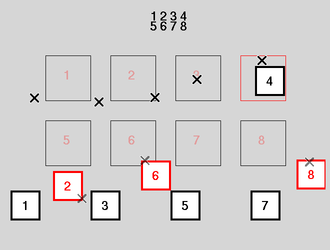 For concurrent manipulation of multiple objects, pre-selecting or constraint based technique are known. MPIS allows users to manipulate multiple objects via multiple pointing devices intuitively. We've constructed a prototype system and had experimental evaluation on it. 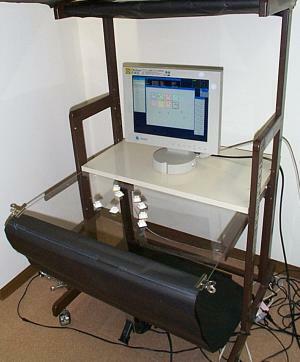 This picture shows the prototype system, that allows manipulation of 8 pointing devices simultaneously. Each device attached different colored felt on its bottom surface, and they are manipulated on the clear acrylic board. A video camera is set below the board, and captures images of devices. The coordinates of each device is calculated from these images. Sushi Master, from "Blade Runner"
The Rutles, Cheese and Onions from "Yellow Submarine Sandwich"